The artists in the exhibition expand well beyond the historical plein air lineage. 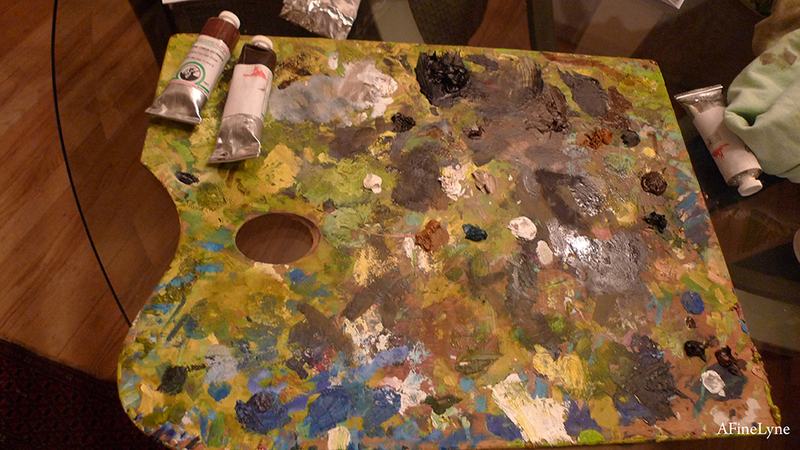 They not only bring painting outside but imagine nature as context, subject, and collaborator. The eight featured artists approach the history, methodologies, and content of outdoor painting from a variety of perspectives. Some of the artists make work exclusively to be shown outside, while others turn nature into both the subject and the medium used to create their paintings. Still others challenge elementary distinctions between nature and the artificial. 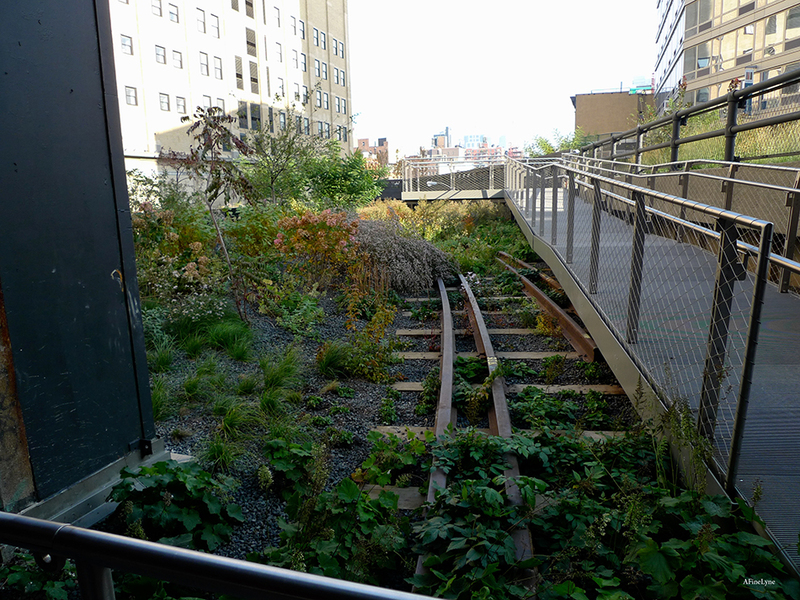 The High Line is an apt site for the consideration of the importance of landscape painting in our time, as the natural features of the park juxtapose with the artificial scenery of the surrounding billboards, building facades and walls, and variety of advertisements. 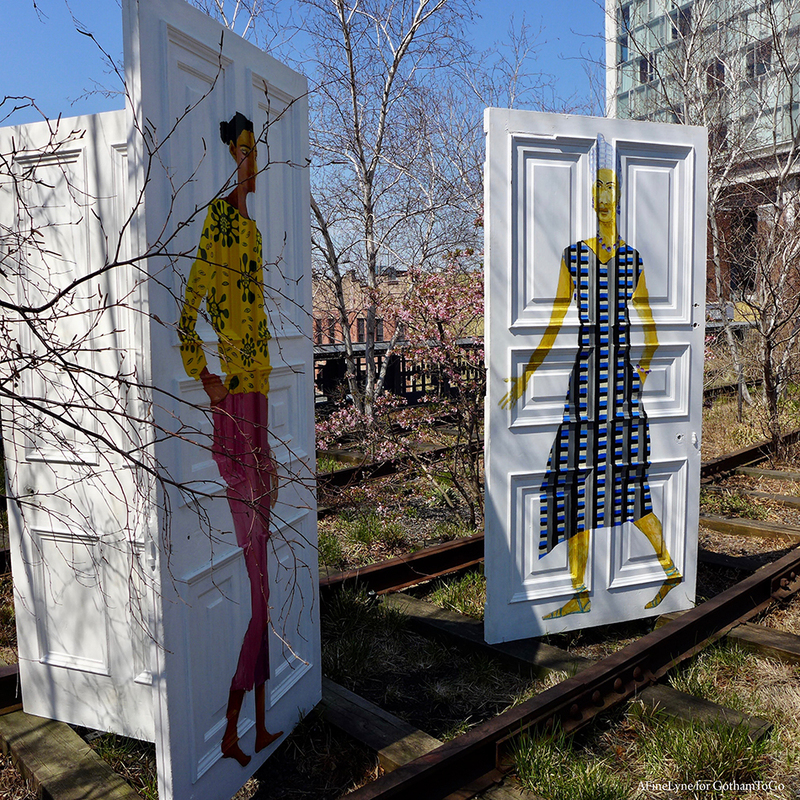 The first of the installations has appeared on The High Line near the Gansevoort entrance. 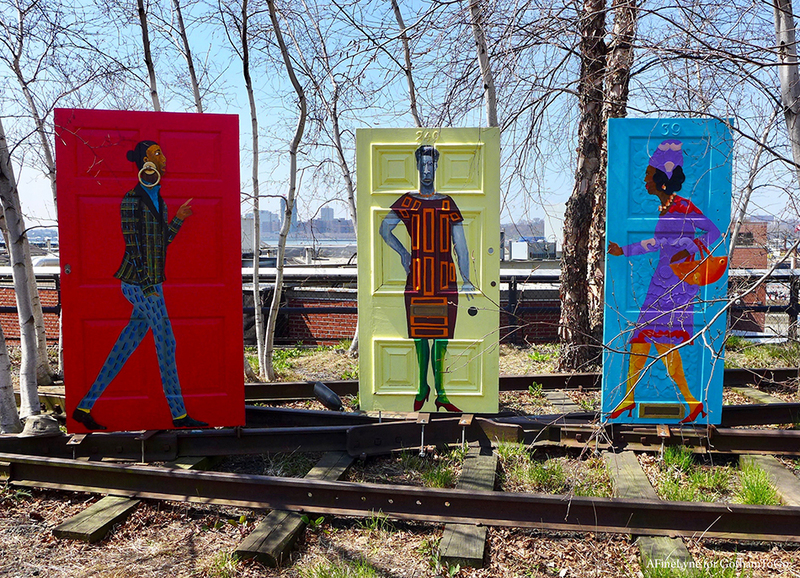 It is Lubaina Himid’s Five Conversations ~ a series of painted doors featuring chatting ladies. 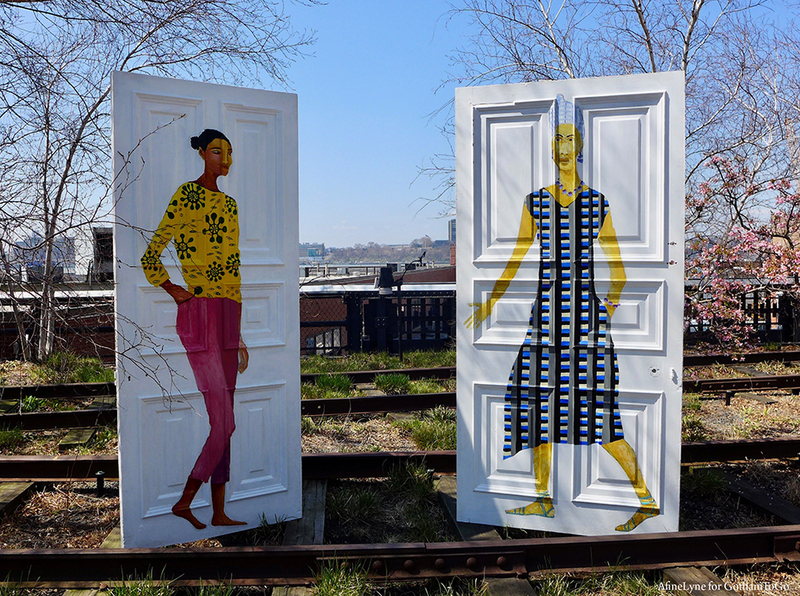 En Plein Air, inspired by the unique site of the High Line, examines and expands the tradition of outdoor painting. The title refers to the mid-19th century practice of en plein air painting (French for “in the open air”). When pre-mixed paints became readily available in tubes, and thus could be easily transported along with canvases and easels, artists brought their studios outside. The act of painting outdoors became associated with the Impressionist movement, which emphasized capturing nature and the fleeting qualities of light while depicting new perceptual and social experiences accelerated by the Industrial Revolution. The inclination to paint outside was one reaction to the overwhelming transformations of life in urban centers, as nature and cities redefined each other under the pressure of modernization—a history that connects to that of the High Line, a remnant of the industrial era of the neighborhood. The artists include Lubaina Himid (b. 1954, Zanzibar, Tanzania); Lara Schnitger (b. 1969, Haarlem, Netherlands); Ryan Sullivan (b. 1983, Malone New York); Vivian Suter (b. 1949, Buenos Aires, Argentina); Ei Arakawa (b. 1977, Iwaki, Fukushima Perfecture, Japan); Firelei Báez (b. 1981, Santiago de los Caballeros, Dominican Republic) and you may remember from exhibition at Studio Museum in Harlem earlier this year; Daniel Buren (b. 1938, Boulogne-Billancourt, France); Sam Falls (b. 1984, San Diego California). 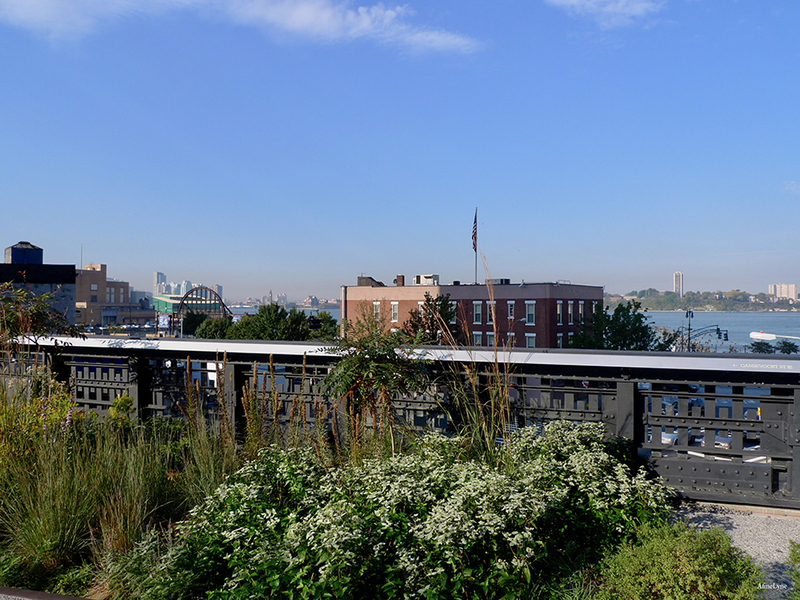 En Plein Air will grace the High Line from April, 2019 through March, 2020 in various locations. The exhibition is organized by Cecilia Alemani Donald R. Mullen, Jr., Director & Chief Curator, with Melanie Kross, High Line Art Associate Curator.